feel free to sub butter or vegan butter for the crisco. i also sub the egg with a replacement because i am vegan since i had a heart attack in 2014. dr’s orders! Put walnut sized pieces on a greased cookie sheet. Butter the bottom of a small glass. Dip in sugar and flatten out each walnut sized ball. Re-sugar glass each time, before flattening dough ball. Bake at 350 degrees for 10 min. This mini version of a simple no-bake tart is easy to take to work as an afternoon snack, but you could also make several portions to serve as individual desserts at a party. 1. In a small bowl, combine graham cracker crumbs and butter. 2. In a medium bowl, whisk together sugar, cream cheese, sour cream and lemon juice. 3. Press graham cracker mixture firmly into bottom of jar. Layer cream cheese mixture and raspberries on top. 4. Spoon jam into a small microwave-safe bowl and microwave on High for 30 seconds or until runny. Stir jam, then pour over berries. Let cool completely, then seal jar and refrigerate for at least 4 hours, until chilled, or for up to 2 days. i will add my vegan version as well. for health reasons, my cardiologist insisted i become vegan. it’s interesting to convert recipes and have them still be delicious! 8 ounces Cream Cheese OR 8 oz vegan cream cheese. i use tofutti. ½ cup Half and Half OR 1/2 cup of soy creamer or organic soy milk. Shuck the corn, rinse it, and slice the corn off the cob. Finely dice the bell peppers. Heat the water and butter in a pot. Once it starts steaming, add the corn and the bell peppers. Cook for 6 minutes, stirring frequently. Add all of the remaining ingredients (except the Parmesan), and stir to combine. Once the cream cheese has melted, pour into a casserole dish. Top with the Parmesan and bake for 375 degrees for 15 minutes. You can prepare this recipe up to this point a day or two ahead of time and then bake it just prior to serving. In a large skillet over medium heat brown bacon, about 5 to 8 minutes. Transfer bacon to a plate. Drain excess bacon grease leaving about 2 tablespoons; sauté garlic and onion until softened, about 5 minutes. Season with 1 teaspoon salt and 1/2 teaspoon black pepper. Melt vegan butter, when it begins to bubble sprinkle flour all over and whisk until flour is absorbed, about 2 to 3 minutes. Add scallions, cream, and vegan chicken stock; bring to a boil and simmer for 2 minutes. Turn off heat. Wash and dry potatoes. Attach slicing blade to a food processor. If possible, set thickness to 1/8″. Trim ends of potato and slice without removing peel. Grease casserole dish with vegan butter and arrange potatoes in rows. Pour creamy mixture over the potatoes followed by a even layer vegan Cheddar and vegan bacon. Cover tightly with foil and bake for 40 minutes. Uncover and bake until potatoes are tender and cheese is melted, about 20 minutes. Garnish with scallions and dollops of vegan sour cream. Serve immediately. Combine chicken, chilis, salsa verde and sour cream in a large bowl and season generously with salt and pepper, cumin and chili powder. Spread 1/3 of the chicken mixture in the bottom of a large baking dish and cover with lasagna noodles. Top with another layer of chicken mixture, then cover with cream cheese mozzarella and Mexican cheese. Repeat with another layer of chicken, cream cheese and cheese, then top with lasagna noodles. Cover noodles with remaining salsa verde and cream cheese, then sprinkle remaining mozzarella evenly over the top. Cover dish with aluminum foil and bake for 25 minutes. Uncover and bake for another 10-15, or until cheese is melted and bubbly. Love quinoa but want to expand your repertoire beyond the usual grain salad or pilaf? These crisp-crusted quinoa cakes provide a mild canvas for the bold flavors of olives, peppers, and greens. With white beans to give them some heft and heartiness, they make a terrific meatless main course. CLICK THE LINK FOR ALL THE IDEAS. you HAVE to watch this video… this looks so yummy, i wish i had one right now! scrumptious! and shallot vinaigrette ties the whole dish together. 1 Cook the farro: add the farro to a large pot of water with a large pinch of salt. Bring to a boil, reduce to a simmer, cover, and cook for 30-35 minutes until tender. Drain and rinse under cold water. 2 While the farro cooks, drain and rinse the beans. Finely chop the cilantro. Halve, peel, and mince the shallot. 3 Make the cilantro vinaigrette: in a large bowl, combine the cilantro,shallot, and 1 Tablespoon white wine vinegar. Whisk in 2 Tablespoons olive oil and season with salt and pepper. 4 Halve, pit, and dice the avocado. Cut the apple into ½-inch cubes,discarding the apple core. Toss the apple into the vinaigrette. 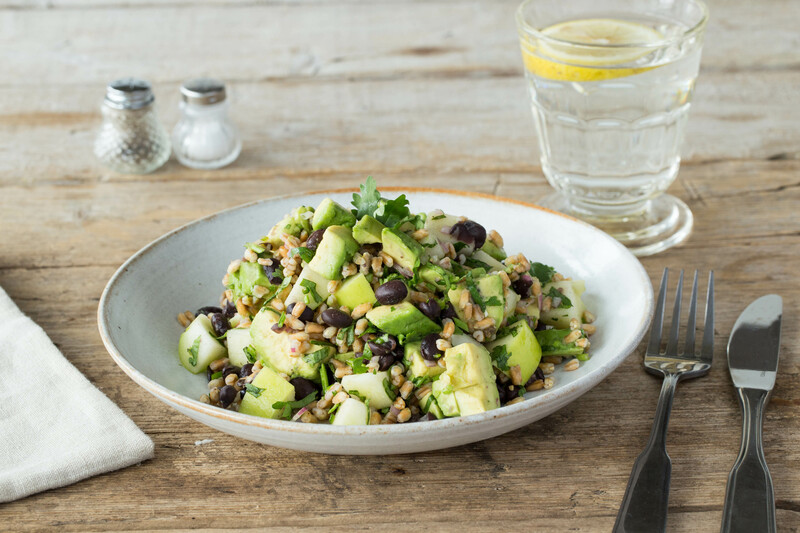 5 When the farro is ready, toss it into the vinaigrette along with the black beans. Season with salt and pepper. 6 Plate the farro mixture, then top with the avocado. Dig in and enjoy! NOTE: i hate cilantro as does my husband, so i got some fresh basil out of my garden and added it instead of cilantro.